to withstand years of daily use. We have been building quality upright Versamatic vacuums since 1979. The quick release foot pedal is designed to release if vacuum is dropped preventing damage to the neck of the vacuum. Pressure relief valve protects vac motor in case of total blockage. Electronic clutch?? ?protects motor and belt. Cleaning paths of 14 inch and 18 inch are available to suit any need. Flat to floor feature allows the vacuum easily to clean under beds and furniture. No-tool brush strip removal for easy maintenance. Versamatics Triple Check filter bag and optional 0.3 micron Air Quality Microfilter improve indoor air quality by trapping contaminants, preventing them from being recirculated into the air. Equipped with a debris trap door that allows for easy removal of clogged debris. Worn brush strip indicator light. 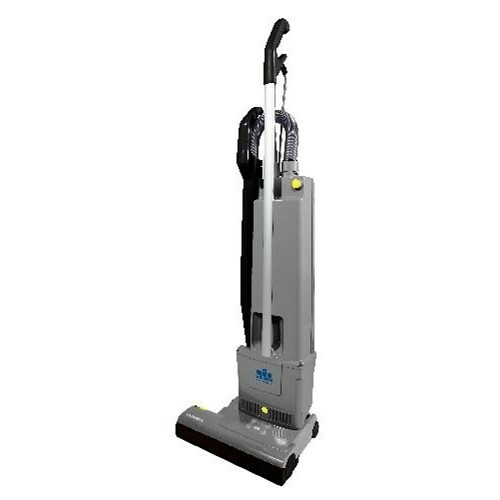 Wand with handle, comfort angle and retractable vacuum hose. 40-foot power cord with strain relief.